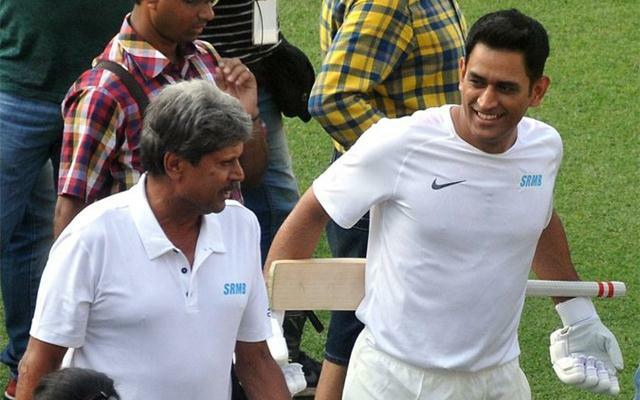 Kolkata, Nov 10: Indias two World Cup winning captains Kapil Dev and Mahendra Singh Dhoni on Thursday took on one another on the cricket pitch, with a bunch of kids egging them on at the Eden Gardens. The two iconic cricketers bowled and batted against each other, toiling in the oppressive heat through the day -- all for a commercial shoot. First Kapil, who led India to World Cup glory in 1983, bowled to Dhoni, who came up with some dashing strokes. After some time, 2011 World Cup winning skipper Dhoni went to the bowler's mark, with Kapil occupying the popping crease. A group of children and teenagers joined and applauded the duo, as part of the shooting, which would finally take the shape of a 30 second advertisement. Noted filmmaker-actor Arindam Sil, directing his first television ad, seemed elated, filled with nostalgia. "It is a dream come true. I have been a fan of these two great cricketers since long. I loved it so much to watch them play. And now to direct them during a game of cricket, and that too, at the hallowed Eden Gardens, that's something I will cherish forever," said Sil, who has directed several Byomkesh thrillers. Sil said Kapil, now all of 58 years, initially said bowling at this age would wear him down. However, once he had the cherry in his hand, the legendary all-rounder looked a bundle of energy. "He went on and on. And then when he batted, it seemed the Kapil Dev of yore was back," said Sil. But it was Dhoni who seemed to Sil as a natural actor. The dashing wicketkeeper-batsman never required a retake. "I never had to ask for a retake from him. He was his natural self before the camera, cool and composed". The Ranchi stumper took time off from the gruelling shoot to give cricketing tips to the youngsters. "He was always smiling and seemed very pally with the kids. He gave them tips on playing aggressively, on what is the best stance," said Sil. As the day made way for the evening, the two took a break from the shoot, and were joined by another cricketing legend Sourav Ganguly -- now Cricket Association of Bengal (CAB) President. Ganguly had led India to the final in the 2003 World Cup. There was a buzz all around, as lensmen and electronic media camerapersons rushed to get visuals of all three in their frames.